Product code: ES6346 Categories: Sold Items, Sold Rings. Simple, elegant and refined are all words that could be used to describe this 5 stone diamond engagement ring from the Art Deco period that sits perfectly on the finger and will always be loved. 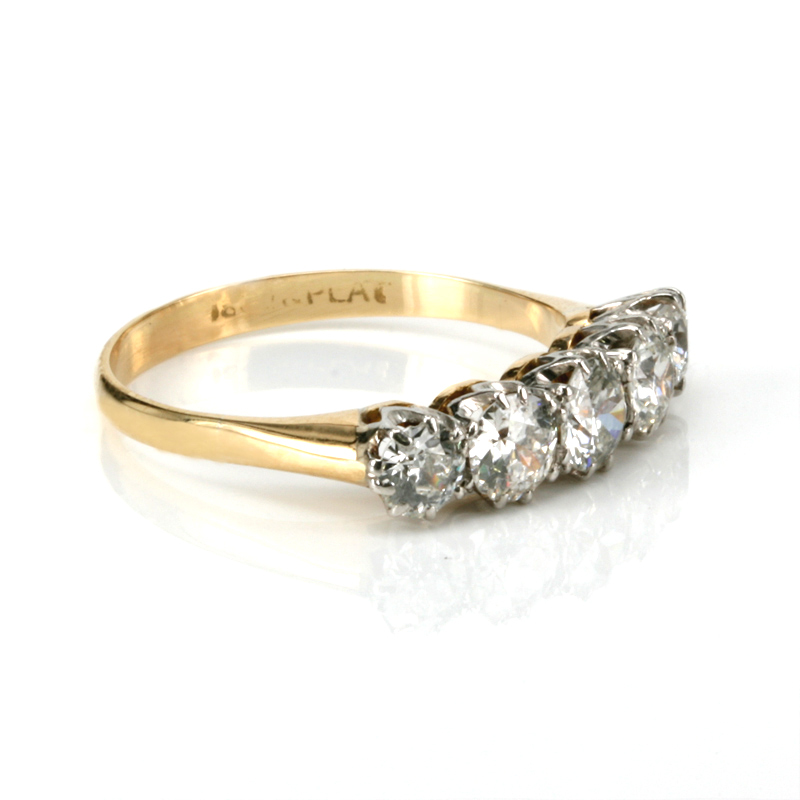 Hand made in 18ct yellow gold and platinum, this 5 stone diamond ring is the perfect engagement ring for someone who has been looking for an engagement ring design that has stood the test of time. Claw set in platinum, the five diamonds are early brilliant cut diamonds with a total weight of 1.44 carats and are F to G in colour and Si clarity meaning that they are in the white range of diamonds and have no inclusions that you can see with the naked eye and all have a wonderful brilliance to them combined with the fact that they were all cut by hand all those years ago. From left to right the ring measures 19.2mm across by 5mm wide at the centre, and would sit so perfectly along side a wedding ring. 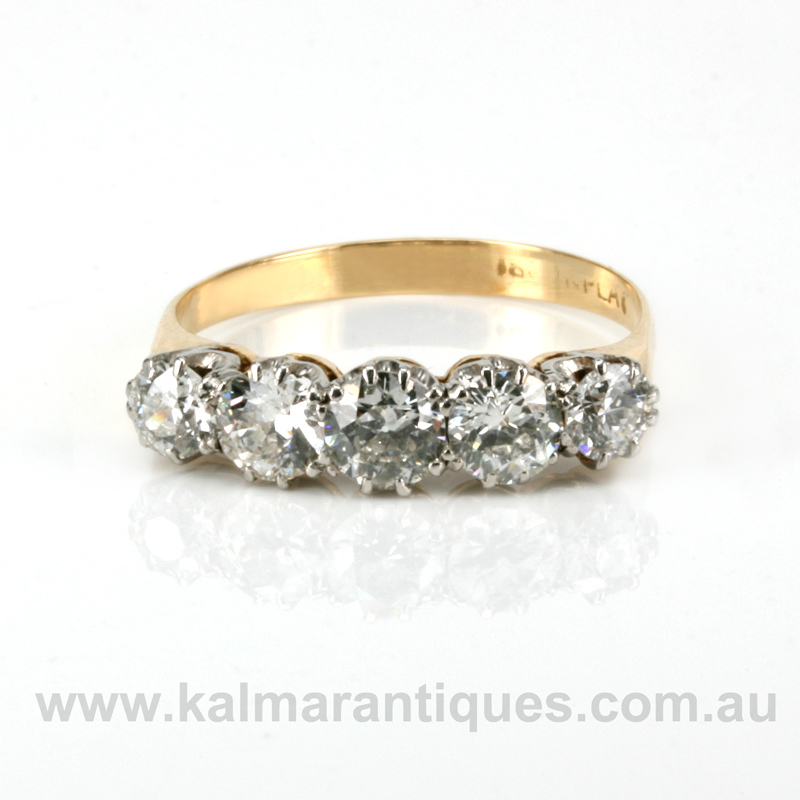 Elegant and timeless, this Art Deco era 5 stone diamond engagement ring is just perfect. Fine Antique and Modern Jewellery, watches and Objets d’Art at the Queen Victoria Building in the Heart of Sydney city. Our own 16 carat rose gold. Please send us an email and we will get back to you shortly.